Now in his 80s, a retrospective of Dan Davidson’s art at Exeter’s PS45 Gallery (formally known as Spacex) offers audiences a unique opportunity to view a large number of paintings from the artist’s diverse sixty year career, all in one place! Non-conforming to any one single style of painting, to view Davidson’s retrospective is to go on a visual tour of this prolific artist’s own personal history as well as that of art history itself! Evident in his apparent need to reinvent and references to other artists in his work, it becomes clear that Davidson is a painter who has discovered much about his own practice through his experiences of having taught as an art teacher and lecturer. The challenge of spotting these various visual references from movements such as Cubism and Impressionism to artists such as Cezanne, Van Gogh, Duchamp, Rothko, De Chirico and Caulfield was rewarding both mentally and visually. As Davidson fervently explores the potentials of his chosen medium through portraiture, landscapes and abstraction; his retrospective also reveals something of what appears a lifelong obsession into the possibilities of art and balance between family and life that are a search which continues to this day. Eunice at Sink (1956) Oil 91 x 69cm. Born in 1931, raised in an orphanage in Lancashire before progressing into a career in Aircraft Engineering and eventually teaching and lecturing art; Davidson’s life as rich and varied as that of his paintings, but also explains the context for some of his motivation. 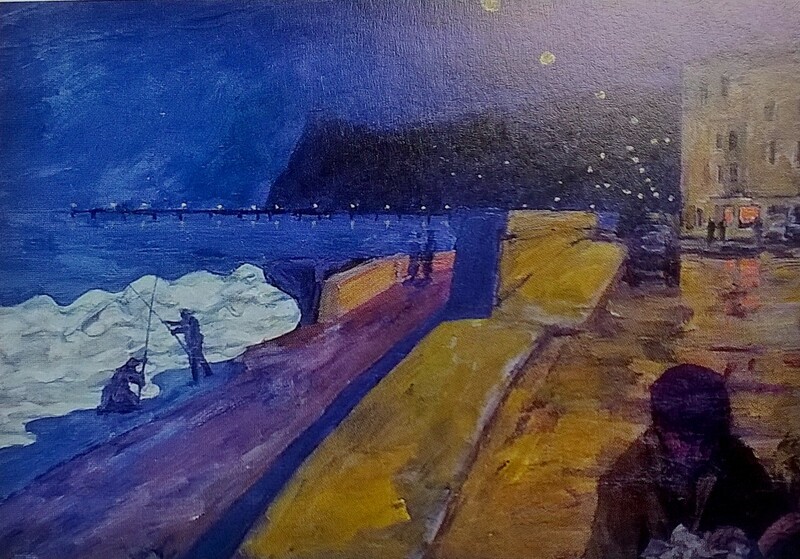 From using his technical training in drawing to pursue a career as an artist (but ill-advised but his peers); he used his painting as a means of self-discovery. The artist’s biography, ‘Identity, Art and Guilt’ also chronicles his early experiences working in brewery, as a cleaner and on the water chute ride at Battersea fun fair; all ideal places, he writes, for ‘a people watcher’ and it is that sense of observation that developed his skills in looking and the ideas for many of his early portraits. 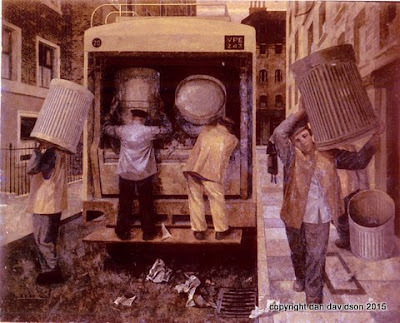 Dustbin Collection (1956) Oil 122 x 91.5cm. In searching for his own identity, Davidson created his own through his art, initially drawing/painting other people. 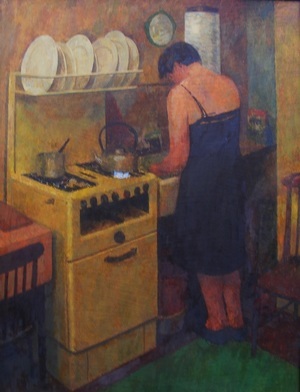 The painting of his wife, ‘Eunice at Sink’ made in 1956 is personal, as are almost all of the subjects in Davidson’s paintings though notably never so much that they are inaccessible to other people. 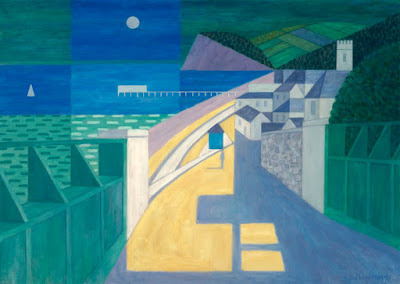 Full Moon over Teignmouth (1999) Oil 122 x 90cm. My only regret is that I would have liked to have seen some of the drawings and workings that led to producing these paintings (though several appear in his biography) as part of the exhibition. Night Fishing at Teignmouth (1999) Oil 76 x 51cm. Never one to grow stagnant, the variety of work in this exhibition demonstrates Davidson’s need to constantly try new things and it is inspiring, for me, to see the energy and relentlessness in the quest for his searching. One of my personal favourites in the exhibition being ‘Office Blossom’ (1985) for its likeness to a Patrick Caulfield whose zen-like, simplified minimal and stripped-back depictions of interiors met with small painterly details such as wine glasses and still-life were appealing in my own work exploring the mundane/everyday. In Davidson’s painting the sterile orderliness of the office is disrupted by scatterings of paper and supplies mimicking that of the blossom tree that fills the view through the window. I enjoy its contradiction of orderly chaos as well as the imagination that something as mundane as paperwork could be given an irreverent sense of joy compared to that of blossom . Elsewhere in the exhibition hedge cutters cut chunks of painted hedges and the canvas itself to reveal hidden landscape behind, cubist cello players are depicted stylistically on vinyl, estuaries meander in red and green, sea waves crash against an invisible train, dots and dashes become ploughed hillsides, lines dance and oarsmen descend in procession as a series of abstract fleshy tones (I think you’ll get the reference here!) It is all familiar and traditional in some sense of the word but never falls into the realms of being tired or irrelevant, if anything gaining new poignancy from when the work was originally painted, in that figurative painting isn’t as prevalent as it once was, rekindling the notion of art that is first and foremost visual as well as meaningful. 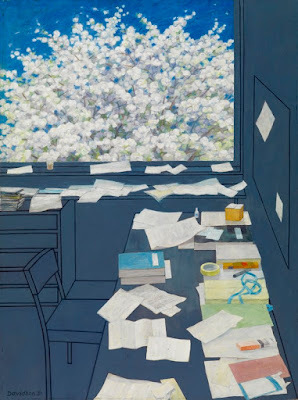 Office Blossom (1985) Oil and Cryla 91 x 67cm. The more recent work such as ‘Fragmented Waterfall’ (2012) revisits the Japanese feel of 'Office Blossom' but from yet another different perspective, this time entirely changing the shape of the canvas from rectangular to trapezoid, colour substituted for greys and quiet realism. 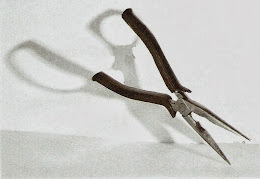 All proof, if ever needed, that Davidson is an artist who is still exploring new ways of working. For artists just discovering Davidson’s work (like myself) this retrospective acts as a reminder to never grow complacent and not be afraid of trying new things or emulating that which inspires you. This does however come with the disclaimer that he makes all of the above look easy! More broadly speaking though, it offers anyone who views it, an insight into the potential of paint as a medium for capturing a personalised, feeling, thinking impression of the world beyond that of what we can physically see and humbling how a whole life has and can continue to be explored through a commitment to ones art. All images in this text copyright of the artist. Quotes sourced from Davidson, D. (2015) 'Identity, Art and Guilt: An Illustrated Memoir' OSC Books.